Suet is one of the best types of food to feed your backyard birds especially in the winter. It is usually made from fat such as rendered animal fat but peanut butter, high in fat, can also be used. Both provide protein and carbohydrates which means energy for the birds as they tend to deplete a lot of it just trying to keep warm during the cold winter months. 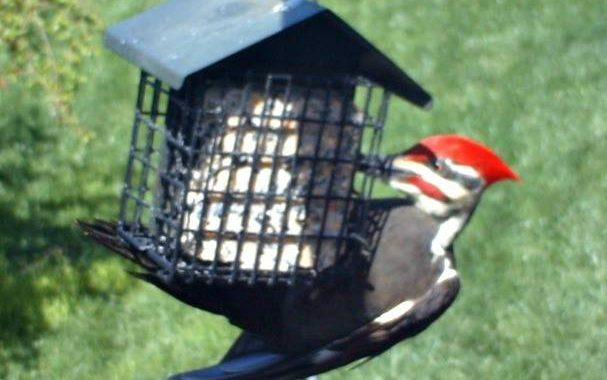 Suet is particularly attractive to many different types of woodpeckers such as the Hairy, Red-bellied, Downy, the Northern Flicker, and even the Pileated (the largest North American woodpecker). Other birds you will see feeding on suet are Chickadees, Jays, Wrens, Brown Creepers, Kinglets, Starlings, Nuthatches, and Titmice. Honestly, most any bird will feed on the suet in extreme temperatures as they need the energy for survival. #1 The Single Suet Cake Feeder that will hold one cake. This is a good feeder if you have a smaller area to feed the birds. #2 The Double Suet Bird Feeder with metal roof has a two suet cake capacity. This is what I use and I place it out on a baffled pole where squirrels cannot get to it. Otherwise they will clean you out very quickly. #3 The Caged Bird Feeder is another option that is squirrel proof. 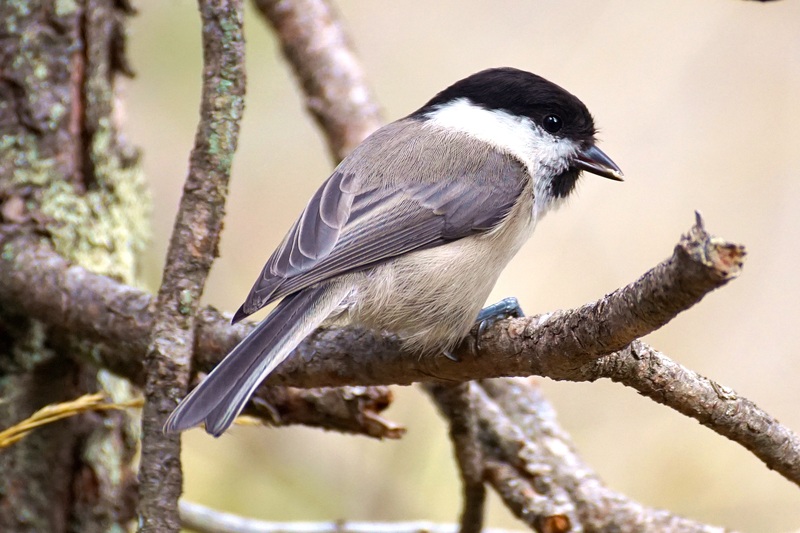 It has the capacity for two suet cakes and smaller birds such as the nuthatches, chickadees, and sparrows are able to eat both inside and outside the cage. However, some of the bigger birds like the Blue jay and Hairy Woodpecker have a harder time so if you want to attract them as well you might also add #1 or #2 to go with it. #4 The Suet Ball Feeder with roof is another option that you can use. The birds can easily access it too. #5 The combination Bird Feeder with Suet Cages is another option if you want to provide the birds both with a bird seed selection and suet all in one place. #6 Suet Bottom Feeder is good for birds that can cling to the feeder such as the Chickadees, Nuthatches, Titmice, and woodpeckers. The Grackles, Jays, and Crows have a hard time with it. You can purchase cakes or the suet balls at the same place that you buy your suet feeder. I like the Nut and Berry varieties as they are loaded with peanuts, almonds, pecans and cranberries, and are designed to attract birds such as the woodpeckers, chickadees, titmice, and nuthatches. Mix peanut butter and bird seed, preferably sunflower or supreme mix. A suet cake feeder holds a cake about the size of 4.5 inches long and wide and about 1.5 inches deep. You can make enough to fill a 9 x 12 pan to cut into the correct size for your feeder or make a smaller batch with a food container. I use the square lunch meat containers that you get at the grocery. They work very well. Then all you have to do is freeze until hardened. Then place the cake in your suet feeder. You can also place this mixture in pine cones to hang in the trees too. The kiddos will love doing this with you! Process peanuts in a food processor until they’re the consistency of peanut butter. Then add the raisins and process for another minute. Add the cornmeal and process again. Press this mixture into a mold of your choice. Melt the peanut butter and lard and add remaining ingredients and cool. 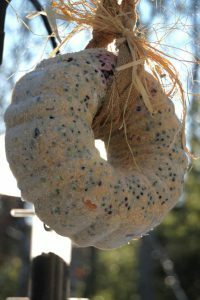 Just a note: These recipes are great for winter suet feeding. The birds do not need the high fat content in the summer and additionally it will soften too fast anyway. There are other types of suet that you can use in summer that the birds will eat and is good for them. This is especially during nesting season. As mentioned earlier, there are many different combinations of ingredients for making your own suet. It all depends on what works for you and the birds. Looking for Something to Make As A Gift? 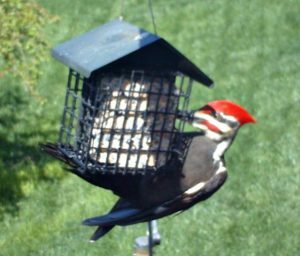 Do you have a good suet recipe to share? I would love to hear about it. Please feel free to comment below. Posted in Wild Bird Food. ← Birds in the Snow!